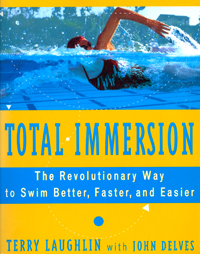 I am about half way through the book: Total Immersion by Terry Laughlin. I have been swimming my laps for years and do have a pretty relaxed stroke. I’m almost 60 years old and this book with its innovative how-to stuff that Terry has put forth makes me feel like a teenager again. Previously I was mainly interested in just keeping in shape. NOW I’m very interested in doing some racing to see how I fare against others. Still working on finding my ‘zone’ or sweet spot for the techniques that he talks about but I’m doing 14-16 strokes per length compared to most people I see doing 25-30 and and I’m going much faster. The edition that I’m reading is @1995 but there is an abridged on circa 2005. Great book for any level of swimmer. Getting my pool resurfaced even as I sit here, so I will have to check this one out. I haven't done laps in years!